Do you have a powerful recruiting strategy to attract millennial drivers? Or, are you at risk of your drivers retiring faster than you can recruit new ones? The average age of an over-the-road driver is 49 years old and the average lifespan is 61 years. We all know that Millennials will be an important part of our workforce in the coming years, but now is the time to actively implement strategies to attract a younger workforce. That's where your Driver Brand Statement comes into play. What is a Driver Brand Statement? Your company carries a reputation among drivers - how you treat your employees, dispatchers, management and customers all shape that reputation, and in turn your brand statement. And now, with the addition of social media, those voices listed above all have the proper megaphone in place to announce that statement to the world - fair or not to you as the company. The fact of the matter is this: You must assess what your driver brand statement is today so you can utilize this message for your marketing and advertising messages to potential drivers. So where do you start? It all begins with targeted "personas" of the drivers you WANT to hire. "A Driver Persona is a fictional, generalized representation of your ideal driver." We define driver personas by their job duties and their shared values, motivations, and personalities. To help create the different personas, start with the different jobs you offer and use stay and exit interviews to dive into each persona’s background, goals, and challenges. Need help developing your Driver Persona? Download our Driver Persona Template to help craft the perfect definition of each driver you're looking to hire. You need to define what 2-3 pain points you’re strongest at solving. Then, focus your marketing message to prove how you specifically solve those problems for prospective drivers. Use what your drivers have said in their exit interviews and cater your message to how your company solves these issues. Identify the trucking companies that are your competition for your driving job. Then create a value curve to visually summarize how you differentiate from those competitors. Alternative Industry Competition: Any blue-collar industry (construction, farmers, factories) where a driver with a similar education/training level can make comparable or better pay with comparable or better home-time. 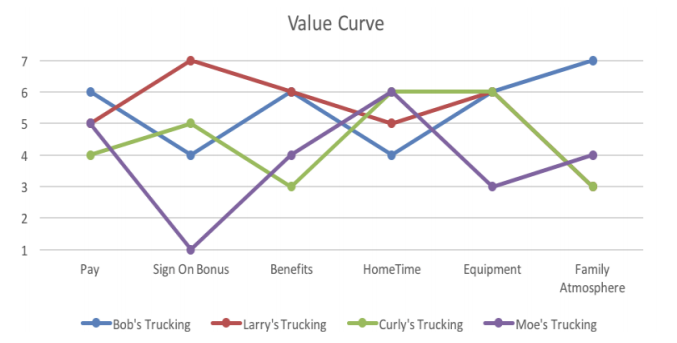 "Create a value curve to visually summarize how you differentiate from other trucking companies." After all of this research, ask yourself: What makes your company special? You can’t be all things to all people. So only be special to your driver personas. Cater your message to each persona and apply this to your advertisements. Instead of relying on the same old statements that you've been recycling throughout the years with countless ad buys, start applying what really matters to the driver you WANT to hire and go after them!